I don’t know about you, but I’ve noticed that the older I get, the more I’ve been paying attention to my joints. When I was younger, I didn’t really think about my elbows or knees much. I just took it for granted that I’d always be able to use them as much or as little as I wanted. As you know, I’m constantly reading up on all kinds of health-related inquiries and potential problems. So, I started researching various types of joint pain and what causes them, and I came across a fairly common condition called bursitis. It can develop in any of the joints throughout your body, most notably the elbows, and is known as olecranon or elbow bursitis. Let me start by explaining that a bursa sac covers every joint in your body. This fluid-filled sac lubricates your joints so that they don’t rub against one another and cause friction. Bursitis occurs when the bursa sac becomes severely damaged, inflamed, or irritated due to any number of reasons. You’re most likely to develop elbow bursitis if you lead an overly active or a sedentary lifestyle, and engage in the same repetitive movements for a prolonged period. For instance, you can develop bursitis from working in an office where you’re sitting and typing at your computer for most of the day, which can put a lot of pressure on your elbow joints. You can even develop elbow bursitis if you tend to do a lot of high-intensity workouts that strain your joints. People who suffer from arthritis, gout, or pseudogout are already at high risk by default. So, if you notice any unusual swelling or pain in your joints, it’s best to consult your doctor, because you may be suffering from an unknown underlying condition. Doctors will normally tell you to rest the affected joint; your elbow, in this case. So you might need a sling. And you’ll definitely need to take a break from any activity or particular movement that could aggravate your bursitis. If it’s a recent injury, your doctor will also recommend you use either ice or a cold compress on the affected joints to help reduce inflammation and prevent pain. This method is usually most effective within the first 24 to 48 hours after the injury occurs. In some cases of elbow bursitis, your doctor will recommend specific stretches or that you see a physiotherapist. There are also a few all-natural treatment options I’ve found that could help treat your elbow bursitis at home. Now keep in mind, I’m not a medical professional; always be sure to seek medical diagnosis and treatment if you need it. Try to eat a variety of healthy fats (especially omega-3 fatty acid foods), fruits, vegetables, legumes, and grains along with getting your daily exercise to help promote good blood circulation throughout your body. These lifestyle changes will help repair and even revitalize your joints to ward off future flare-ups. If you’d like an alternative way to relieve pain (and avoid painkillers), look into acupuncture. It’s considered very safe; just make sure you see a qualified practitioner. Applying frankincense or peppermint natural essential oils on the affected area naturally promotes blood circulation, which can help to alleviate pain and inflammation. Ginger is a natural anti-inflammatory, so it could help reduce the swelling and pain related to elbow bursitis. You can purchase powdered ginger capsules at your local pharmacy or natural food store; follow the package directions for dosage. While you’re at it, have some nice ginger tea! Talk to your doctor if these natural treatment options don’t work for you. 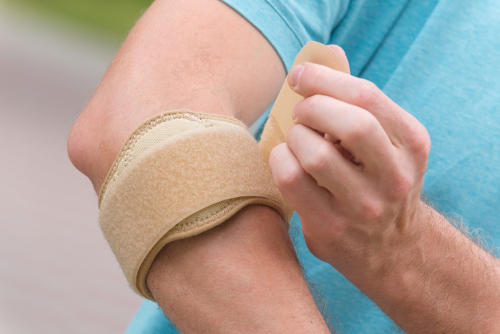 He or she may be able to recommend some other medical treatments to help relieve your elbow bursitis. Remember that leading a moderately healthy and active lifestyle is one of the best things you can do for your overall health and well-being. Bracilovic, A., “Elbow (Olecranon) Bursitis,” Arthritis-Health, May 2, 2012; https://www.arthritis-health.com/types/bursitis/elbow-olecranon-bursitis, last accessed June 19, 2017.